The 8088 is a UL 768-rated combination lock made by Sargent & Greenleaf. It is rated for 30 minutes of protection against manipulation and 10 minutes of protection against surreptitious attacks. There are no defined protections against destructive entry in the 8088 specifications. The 8088 was developed in the 1950s for the United States government through one of Sargent & Greenleaf's government contracts. It has since been superceded by the S&G 8077 and the S&G 8065. The 8088 is a combination lock that requires three numbers be correctly dialed into the lock for the shackle to be released. It uses three internal wheels and a fence-type mechanism similar to those used in traditional combination safe locks. The dial has fifty graduations numbered 0-49, giving the 8088 a total of 125,000 (503) theoretical permutations. The 8088 functions very similar to traditional rotary combination safe locks. It uses a set of wheels, a drive cam, a fence, and a mechanism which resembles a butterfly. The butterfly hooks into the shackle, restricting its movement. When the correct combination is dialed the wheels and drive cam are properly aligned under the butterfly. Pulling the shackle causes the butterfly to collapse and pushes the fence into the gates, releasing the shackle. The opening index mark is location at 12 o'clock on the face of the lock. The changing index, used to reset the combination, is located at 11 o'clock. All combinations are a three number sequence that ends with 0, for example 24-10-40-0 and 42-28-9-0. The last number is required to set the drive cam in the proper position. The factory combination is 25-0 (25-25-25-0), but older models may use 10-20-30-0. 8088 with back cover removed. True gates on each wheel. 8088 in the unlocked position. The dial of the 8088 may be stamped with a two digit number to prevent casual replacement of the lock. Dial counter-clockwise four full revolutions, stopping on 10. Dial clockwise three full revolutions, stopping on 20. Dial counter-clockwise two full revolutions, stopping on 30. Pull the shackle to unlock the padlock. To dial the factory 25-0 combination (25-25-25-0), all wheels are dialed counter-clockwise four times, stopping at 25. Then dial clockwise, stopping at 0. Pull the shackle to unlock the padlock. Unlock the lock using the correct combination. Hold the change key hole open while returning the shackle to the locked position. Dial the original combination, aligning each wheel with the changing index. Insert the change key into the change key hole and turn in 90° clockwise. Dial the new combination, aligning each wheel with the changing index. Turn the change key 90° counter-clockwise and remove it from the lock. Do not close the change key hole! Dial the new combination to the opening index and open the lock. Open the lock repeatedly to ensure the new combination works before closing the change key hole. The opening index is at 12 o'clock, the changing index at 11 o'clock. Incorrectly dialing any wheel to the opening index and closing the change key hole during step 3 will render the lock non-functional. The 8088 cannot be disassembled non-destructively. Four retaining rods around the lock body must be drilled to allow the back cover to be removed. Rods are located at 2, 3, 9, and 10 o'clock on the back of the lock. The pins at 3 and 9 o'clock are horizontal while 2 and 10 are vertical. 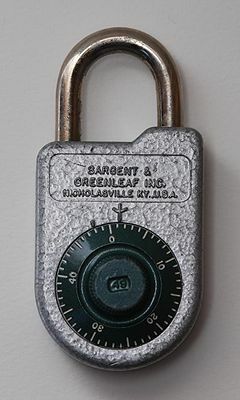 Obsolete Combination Padlocks [...] The current NRC-acceptable combination padlock is Sargent and Greenleaf Model 8077A. Its predecessor design was identified as Model 8088, appears to be currently available and is in use at some licensee facilities. The Model 8088 units can be easily defeated, do not meet the terms of Executive Order 12356, are not approved by GSA, and are not acceptable for the protection of either classified material or safeguards information. Decoding is possible through both manipulation and radiological attacks. Semi-destructive decoding is possible, particularly drilling the lock body and viewing the wheel pack or fence. ↑ Tobias, Marc (1971). Locks, Safes and Security: An International Police Reference. ISBN 0398070792. ↑ Information Notice No. 82-46: DEFECTIVE AND OBSOLETE COMBINATION PADLOCKS United States Nuclear Regulatory Commission Office of Inspection and Enforcement. 1982-11-26. Retrieved 2012-03-22. This page was last modified on 22 May 2013, at 15:30. This page has been accessed 97,446 times.